Linkin Park are streaming a performance of their 2017 track, “Sharp Edges”, from “One More Light Live”, ahead of its release on December 15. The tune first appeared on the band’s latest album, “One More Light”, which debuted at No. 1 on the US Billboard 200 earlier this year. 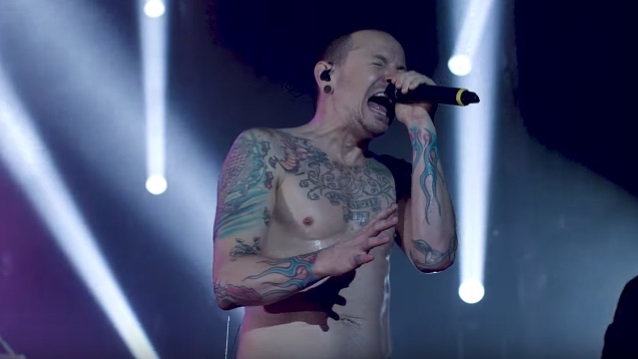 The new project presents material from the group’s final tour with singer Chester Bennington, who committed suicide at his Los Angeles area home on July 20 the age of 41. "We dedicate this live album to our brother Chester who poured his heart and soul into 'One More Light',” says the surviving members of Linkin Park in a joint statement. "The shows we played together during the early summer of 2017 were extraordinary. Chester shared with us that he felt this was the best tour we had ever done. The camaraderie and joy we experienced on stage reflected our deep connection with each other, with our fans, and with the music. "Every night before walking out onto the stage,” continues the band, “we would huddle, get focused, and share whatever last-second remarks popped into our heads. Chester always took it upon himself to turn the name of the city where we were playing into a first-rate run. This was our ritual. Best of all, it was a moment to express our gratitude that we were living our dream. The group hosted a tribute concert in honor of Bennington at the Hollywood Bowl on October 27, where they were joined by members of Avenged Sevenfold, Bring Me The Horizon, Blink-182, Sum 41 and System Of A Down, among others.